Belknap Press: An Imprint of Harvard Universi, 9780674736559, 480pp. Between 1793 and 1794, thousands of French citizens were imprisoned and hundreds sent to the guillotine by a powerful dictatorship that claimed to be acting in the public interest. Only a few years earlier, revolutionaries had proclaimed a new era of tolerance, equal justice, and human rights. How and why did the French Revolution's lofty ideals of liberty, equality, and fraternity descend into violence and terror? 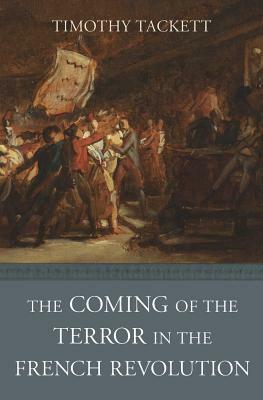 The Coming of the Terror in the French Revolution offers a new interpretation of this turning point in world history. Timothy Tackett traces the inexorable emergence of a culture of violence among the Revolution's political elite amid the turbulence of popular uprisings, pervasive subversion, and foreign invasion. Violence was neither a preplanned strategy nor an ideological imperative but rather the consequence of multiple factors of the Revolutionary process itself, including an initial breakdown in authority, the impact of the popular classes, and a cycle of rumors, denunciations, and panic fed by fear--fear of counterrevolutionary conspiracies, fear of anarchy, fear of oneself becoming the target of vengeance. To comprehend the coming of the Terror, we must understand the contagion of fear that left the revolutionaries themselves terrorized. Tackett recreates the sights, sounds, and emotions of the Revolution through the observations of nearly a hundred men and women who experienced and recorded it firsthand. Penetrating the mentality of Revolutionary elites on the eve of the Terror, he reveals how suspicion and mistrust escalated and helped propel their actions, ultimately consuming them and the Revolution itself.